When Steve and I were at CES, we had the opportunity to hang out with fellow NosillaCastaway Joe LaGreca. 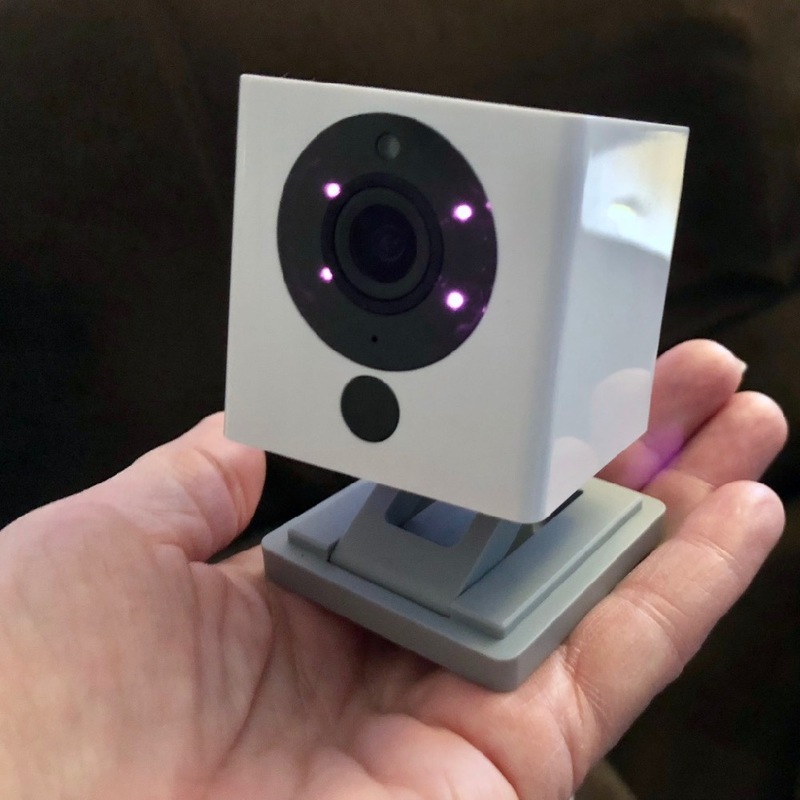 While we were talking about the disappointment of the security model for D-Link and their $150 Omna webcam, he mentioned that he uses a little camera called the WyzeCam. We were intrigued because Joe said the WyzeCam is only $20 plus $5 shipping. But how good could this camera be? Joe showed us a live erityideo feed of his kids’ playroom – and it was pretty darn good. For $20, it was amazing. Joe cares as much about security as we do (if not more) but since a $150 HomeKit-compatible webcam from a big-name networking company doesn’t guarantee us great security, I have changed my expectations. The WyzeCam is available from their website at wyzecam.com for $20 plus $5 shipping, or for $26 with free prime shipping on Amazon. If you get a message saying it’s out of stock, don’t worry about it, buy it anyway. Joe told me to ignore that warning and he was right. The WyzeCam site said it was 4 weeks shipping, and it shipped 2 days after I ordered it. I expected the WyzeCam to be cheap feeling, poorly designed and to have raw cardboard packaging. Surprisingly the WyzeCam came in very professional and minimalistic packaging and the camera itself feels very solid and well designed. The WyzeCam is a small white cube, maybe 2.5 inches on a side, with a very clever articulated base. When you pull up on the camera from the base, you can rotate the view up and down and the base can rotate with respect to the cube for the camera. For those who speak my language, it rotates in both azimuth and elevation. The camera can sit on a shelf, or be mounted to a wall with a magnet and an adhesive metal plate. It does require power to operate and comes with a small USB US power plug. I love IoT devices, but I truly detest setting them up. It’s always a nightmare to get them connected to the right network and getting the app to talk to the device. The WyzeCam setup was probably the easiest of any devices we’ve ever used. One trick in the WyzeCam was that you point the camera at your phone’s screen for it to read a QR code to identify itself. It also happily jumped on our IoT network without any faffing about. WyzeCam even has a short video to show you how to do the setup. Enough preamble, let’s talk about what this camera can do. The WyzeCam app is beautifully developed with intuitive menus that make discovery easy. Once your camera is set up and named, you’ll see it in a static view under Devices with a share button in the upper right. With this button, I was able to add Steve by his email address, and while he can view the camera, he cannot change the settings as I can. If you tap on the camera view, it opens into the Live Stream view with a little animation to show you it’s connecting. Once connected, you’ll see a full-screen button in the upper right which fills the iPhone screen into landscape view. In the bottom right of the video, you’ll also see a date and time stamp which could come in handy in the case of a burglary. Not perfect evidence since obviously times can be tampered with but can’t hurt. The WyzeCam has a 110° field of view which is actually plenty. We were able to set it up in a room with three entrances and it easily captures the entire room. You can choose between SD and HD quality video (720 and 1080p). We find, as Joe suggested, that the lower quality video is quite good and the camera responds much more quickly from outside of the house when it’s on 720p. I compared the supposedly 1080p video from the $150 D-Link Omna camera to the $20 WyzeCam at 720p, and the WyzeCam was much better. The Omna looked fuzzy and muddy in comparison. Pretty amazing. WyzeCam also has a night vision mode that comes on automatically in the evenings. When looking at the camera’s view in the app, you can tap on Night Vision to change it from auto, on, or off entirely. We like it on auto because, well, it works at night! The last button says Album and when selected it shows Videos and Photos. At first, I couldn’t figure out what this was because both the video and photo sections were empty and the app was non-responsive. I restarted the app thinking it was locked up, but when I tried again the same thing happened. The second time I just waited a while, maybe a full minute, and finally, videos and photos both populated with the media I had just recorded. It’s nice you can see just the media you’ve captured from the device, but if you want more instant gratification, you can just go into Photos and the images and videos come up more quickly. In the WyzeCam Album, there’s a pencil in the upper right and when selected, you are shown a Share and Delete button. The Share option was also slow to respond so again I think you’re better off working in Photos. Back on the Live Stream view you also have a Playback view. Playback requires a microSD card. It doesn’t come with it, but with it, the WyzeCam will continuously record the room and you can use a little slider to go back in time to view it. The WyzeCam automatically writes over the older stuff when it runs out of space, so you’re really only limited by the amount of storage on the memory card. Now let me tell you why you should shut this feature off. I was perusing our past history and realized I could not only watch video, but listen. I came across a discussion Steve and I had where we were not understanding each other. I’m sure this NEVER happens with anyone but us, right? Anyway, it occurred to me that I could easily re-listen to this segment and figure out exactly where Steve misunderstood me and prove how I was totally making sense and being clear. If you don’t catch how this would be a very bad thing, go watch the Black Mirror episode called “The Entire History of You” and I think you’ll turn this feature off for family peace. Time Lapse is available on the WyzeCam but it isn’t working quite as expected. You set the start and stop times, along with the interval, and then it starts recording. I was able to do all that, but it didn’t stop recording at my selected time. I eventually just hit the stop button but it didn’t appear to save the video into Photos. I looked in Albums and it was empty. I contacted WyzeCam via their online chat and Matthew tried to help. He suggested I do a full reset on the device. I didn’t want to because I didn’t want to redo my settings. He explained that my settings are synced through their cloud service so I wouldn’t have to redo it. I gave that a try and while it didn’t fix the start/stop part, I did eventually leave Albums open long enough that it populated with all of the ones I’d been looking for. The Album view takes a really long time, so I guess I just have to be more patient. We also tried installing WyzeCam on my spare iPhone but even there I was unable to get the time lapse to stop by itself. Matthew asked for a log file to be sent so his team so they can figure this one out. Very responsive help from such a small company. 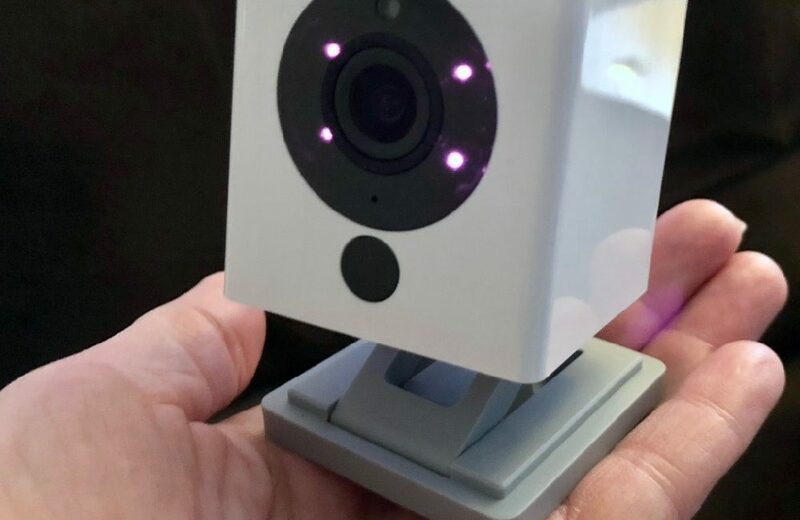 The $20 WyzeCam comes with 14 days free, encrypted cloud storage on Amazon S3, and you don’t even have to create an account. Our $150 Omna webcam has local storage too, but it doesn’t have any kind of cloud storage (or the ability to record from our phones). In the main (static) view, there’s a button at the bottom to open the Notifications page, and that’s where you can access any videos your camera has recorded according to your settings. Let’s say you’re away on vacation and something happens in your home while you’re gone. You can access these videos from the app and download them to your device so they’re not erased from the free storage. Amazingly good interface. Let’s take a look at the Camera Settings, accessed under the gear in the upper right on the static view page. This is where you can turn on the motion detection I mentioned earlier. You can also set the sensitivity to low, medium or high. One night our cat Grace walked by on the back of the couch at 3 in the morning and it triggered the WyzeCam so I caught her in the act. It also triggered our Hue Lights motion sensor (the one Denise recommended) so the lights came on while I was watching Grace on the camera. Pretty cool. The WyzeCam also has an option for sound detection again at low, medium and high sensitivity. This could be handy to detect the sound of broken glass if someone was to break into your house. The next two settings confused me at first. There’s a switch for smoke detection and carbon monoxide (CO) detection. I lit a candle right next to the WyzeCam, waved it around a bit and then blew out the candle so the smoke was right in the WyzeCam’s face, but nothing happened. After studying the support pages, I found out that the WyzeCam is tuned to listen for the frequencies put out by common smoke and CO sensors. It means it can send you alerts if anything should happen. I think that’s really cool. You can set the alert schedule to a specified span of time or have it on all day. Again, $20 for this camera. There’s a status light on the camera you can switch on or off and there’s an option to rotate the image 180°. I tested this and it basically means it will turn the image upside down. This is an important feature if you want to mount the camera under a shelf instead of on top of it. There’s a switch to record to the microSD card as we discussed earlier, and this is where the family peace setting is. You can have “Continuous recording” (see Black Mirror reference) or you can set it to the much more tranquil “Record alerts only” option. The setting also shows you how much memory you have left on the card in case you want to pull it and save for prosperity and put in another one. The last section in settings is for device information where you can find the MAC address, verify which network it’s on and check for firmware upgrades. There are several recent firmware upgrades shown on the WyzeCam website so that gave me a good feeling but when I pinged them on chat and in a longer conversation through email, I discovered that they too haven’t patched the KRACK vulnerability in WPA2 wireless encryption. WyzeCam doesn’t make their own chipset or the firmware for it, so they’re relying on their Chinese supplier to send them the firmware update. They were very open about it and I encouraged them to keep the heat on. For some reason I was more forgiving to a small outfit with a $20 camera than I was to D-Link with a massive staff, tons of products and who have been in the business of protecting our wireless traffic for decades. The bottom line is that this is the most joy I’ve gotten out of a tech product in a very long time. For $20 I cannot believe the quality of the hardware, the quality of the video itself, the ease of use of the interface on the app, and the online tech support. I love the WyzeCam and I think I’ll buy more, maybe even replace the $150 Omna Cam with one! Have you encountered any of this yourself, or do you or Bart of friends have any knowledge that might help put our minds at ease on this one, or justify our fears?